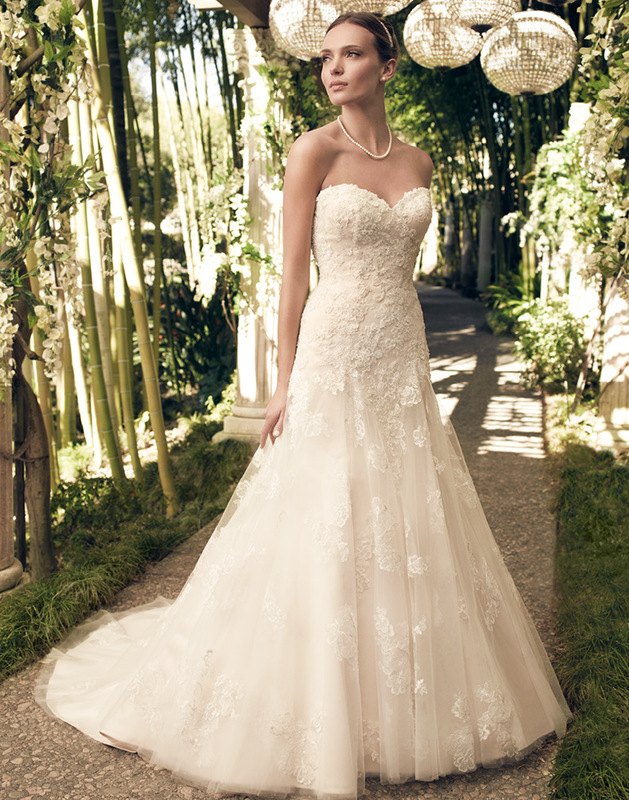 We are very excited to welcome two breathtaking gowns to our Casablanca Collection here at Blue! Our first gown is a fabulous A-line. This A-line gown has an alluring sweetheart neckline which flows into the rest of the gown. With its beaded lace appliqués on embroidered lace it lies perfectly over smooth satin to finish its look. This romantic gown is sure to make jaws drop as it glides down the aisle. Next is this stunning ball gown! It has a sweetheart neckline which leads into a ruched taffeta band. This band is beaded with Swarovski crystals, rhinestones, sequins, pearls, and 3-dimensional organza flowers. But the finishing touch is the two layers of tulle: a printed shimmer tulle and structured tulle which make up this unique skirt! This ball gown will turn heads as it moves across the floor! Our other Casablanca gown is a new favorite here at Blue!